Question: What is the Todd-AO system? Answer: Todd-AO is the ultimate result of intensive research by a team of research and engineering scientists headed by Dr. Brian O'Brien at the American Optical Company laboratories and of the Cinema Department of the Philips Works, Eindhoven, Netherlands. It is a motion picture process which employs one camera and one projector. The final results are said to take the motion picture technique a step closer to smashing the illusion barrier between the real and the make-believe. Question: How was the Todd-AO system originally conceived? Answer: Michael Todd went to Dr. Brian O'Brien at Rochester, New York, to ask if such a system could be created. O'Brien, said to be the Einstein of optics, answered that it was possible but that the facilities of a large optical firm would be required. Todd then approached the American Optical Company to undertake this and was informed at that time that O'Brien had agreed to join it. Question: Is the Todd-AO projector adaptable to other media? Answer: With the exception of Cinerama, the projector has switch-Iever adaptability to all media. Changeover of the Todd-AO projector to any other system is said to be "almost immediate." Question: What is new in filming a picture in Todd-AO ? Answer: The cameras are new although similar in general principle of operation to standard 35mm cameras. The lenses used in the photography are completely new. The sound recording system is unusual in that it provides six independent sound channels with high fidelity and signal-to-noise ratio. Question: Why is 65mm film used? Answer: 65mm film is used in the cameras to provide a picture area nearly four times that of the standard 35mm camera frame. This larger picture area is said to permit greater detail and sharpness in the picture projected in the theatre. Question: Why is 70mm film used in the projectors? 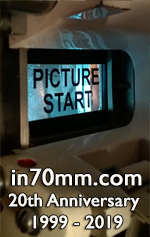 Answer: The projected picture is the same size as the camera negative picture, but 70mm film is used in the projectors to provide space on the film for the six magnetic sound tracks. Question: Why is the film speed 30 frames per second? Answer: Thirty frames per second has been selected instead of the usual 24 frames, to reduce flicker and to give greater continuity to rapid motion across the screen. if the picture is large the eye is more sensitive to flicker. Question: How does Todd-AO plan to eliminate image distortion from Keystoning due to projection on a deeply curved screen from high angles of projection? Answer: The American Optical Company method of photographic printing, it is claimed, not only eliminates Kestoning but other distortions resulting from projection on a deeply curved screen from high angles in the theatre. Question: What is the Todd-AO screen made of? Answer: The Todd-AO screen is made of long fibre cotton fabric impregnated and coated on both sides with slow-burning plastic in order to meet theatre fire prevention requirements. The screen is porous to permit light to pass through instead of bouncing back into the eyes of patrons, and is imbedded with pin-point sized mirrors at the ratio of 600 to a square inch. The mirrors direct light and are said to prevent re-illumination of light from one side of the deeply curved screen to the other. Question: What determines screen size and curvature? Answer: The size of the Todd-AO screen is determined largely by the size of the theatre into which it is to be placed. Question: What are the advantages of a deeply curved screen? Answer: The most important visual result is that a very large portion of the audience has a sensation of personal participation in the scenes. Another aspect of the deeply curved screen is its comparative freedom from squeezed images when viewed from the side seats in the front rows. The ability of the deeply curved screen to avoid "squeeze" is stolen straight from Euclid's "Geometry." Euclid taught that for an observer standing on the edge of a circle, equal arcs subtend equal angles anywhere on the circle. On the Todd-AO screen this has the result that an observer can walk right up and lean his cheek against the screen, and still get a good view of the picture. Question: As a rule, what size screen is preferred in Todd-AO ? Answer: As a general rule the preferred screen is the largest screen that it is possible to build in the front of the theatre. Question: What are Cine-Apergon projection lenses? Answer: The Cine-Apergon projection lenses are a series of seven projection lenses designed for the Todd-AO system. These are lenses of unusual speed and capable of covering the wide film with crisp realism to the very edges. Without the use of special aspherical optical surfaces, the projection lenses would have been the weak point in the system. Question: Can Todd-AO projectors be used in upward-throw drive-in theatres? Answer: Yes. The projector includes a tilting mechanism which rotates around a high point so that there is only a slight movement of the center of gravity. Projection angles of as far down as 28° and as far up as 20° can be reached. Question: What are some of the features of the Todd-AO projector? Answer: The projector will take 70mm film or 35mm film with only minor adjustments in the mechanism, and can be changed in about four minutes. The projectors are equipped to handle multi-channel magnetic sound for Todd-AO, 35mm magnetic sound for CinemaScope, or conventional optical sound. All three sets of sound equipment are provided and the only change necessary is to thread the film through the desired sound head. Sound on separate film can be used with a selsyn synchonizer system that is available. Only certain high-power arcs are recommended for the Todd-AO system. An unusual feature of the design is that all the mechanism, including sound heads, is included in the projector head thus eliminating the possibility of errors due to unequal reel pressure. Other features include a centrifugal switch to drop the dowser if the film speed is too low, a water flow switch to cut off the arc if the cooling water is cut off, and stop switches on both sides of the chassis. The optical preamplifier is of a special plug-in design so that a new unit can be substituted almost instantly in case of breakdown. Two separate motors are provided to run at 30 and 24 frames per second respectively. Question: Is the Todd-AO system completely integrated? Answer: Yes. Any attempt to compromise on its installation in the theatre would be as self-defeating as trying to run an automobile with some of the parts missing.